Do you need Mice control & removal in Hemet, San Jacinto, Murrieta, Menifee, Winchester, and surrounding areas? Mice have high metabolisms and leave droppings behind where ever they travel. 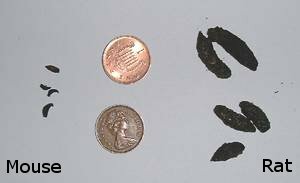 Often numbering in the thousands, these droppings may or may not smell bad, but are unsightly and carry diseases which can be contracted by humans. Mouse droppings must be removed along with your rodent population. Call 951-652-0505 today for our specialized mice control & removal. Are you noticing water stained areas on your sheetrock? These are actually mouse urine stains. Mouse urine contains a pheromone scent that attracts new rats to the area. Rodents body oils get trapped in their fur which collects dust and debris. This brown colored grease also has the pheromone scent. As mice travel the same area over and over, it stains the area brown. You might notice the brown staining on the top wooden beam, especially where the light colored wires cross the beam. Mice teeth grow quickly, making them highly active chewers. Wire chewing is perhaps the most dangerous damage that mice cause. As the rodent chews on a live electrical wire in your attic or wall void, it causes the wire to spark which lead to electrical fires and home loss. Mice get into and destroy stored goods in your attic, garage or closets. Without removing your mouse population, these destructive pests will continue to chew, defecate and urinate all over your most prized possessions. Mice travel over your insulation, matting it down and reducing the insulation’s R-Value and effectiveness. They also clear out insulation in areas and collect it for nesting material. Upon successful completion of a baiting program, you may have to deal with dead rodents. Unfortunately, AmeriGuard cannot control where mice choose to die, which can often be inside the attic or in hard to access wall voids. Dead mice cause a horrible odor as they rot and decay. As an additional service, AmeriGuard can provide Odor Bags, which remove the odor even if the decaying mouse is unable to be removed. Most locations in Southern California are under constant pressure from rodents. In these cases, we recommend an exterior baiting program to complement our rodent exclusion or mouse trapping programs. Exterior baiting will be conducted on a monthly or bi-monthly basis. Rodent bait consumption levels will be recorded and available upon request. Trapping only programs are available for those who do not want to use rodenticides. Trapping requires regular maintenance, we recommend having your traps checked every two weeks. Your AmeriGuard technician will schedule a convenient time to check your mouse traps. Exterminating your rodent population is only half of the battle. Exclusion is the process of making sure new mouse can’t get in to your home. A careful inspection of openings around attic spaces, pier-and-beam foundations, etc. is necessary. Holes can by blocked with 1/4 inch opening wire mesh found at your local hardware store, or metal flashing. Small openings can be blocked with steel wool. AmeriGuard will give a free exclusion inspection and rodent exclusion quote for every customer who orders a rodent baiting or trapping service. Hantavirus is one of a group of viruses that are carried by mice. It is contracted primarily by inhaling airborne particles from rodent droppings, urine or saliva left by infected rodents. Hantavirus is also communicable through direct contact with infected rodents. The deer mouse is the most common carrier of hantavirus, but other rodents can be possible carriers without showing any signs of illness. The length of time hantaviruses can remain infectious in the environment is variable and depends on environmental conditions. There is no way to determine how old a dropping is, so all rodent droppings should be handled as if they are infectious. AmeriGuard Pest can provide you with a quote on cleaning up and decontaminating areas where there is a presence of dead mice and rodent excrement (feces, urine, or saliva) as well as remove all accessible mice inside and fully clean out the accessible areas of your attic to remedy the mess and the scent that was left behind. These services are specialized and require the use of personal protective equipment such as tyvex suits, respirators, and sanitizers.